A latent semantic analysis (LSA) model discovers relationships between documents and the words that they contain. An LSA model is a dimensionality reduction tool useful for running low-dimensional statistical models on high-dimensional word counts. If the model was fit using a bag-of-n-grams model, then the software treats the n-grams as individual words. Create an LSA model using the fitlsa function. Number of components, specified as a nonnegative integer. The number of components is the dimensionality of the result vectors. Changing the value of NumComponents changes the length of the resulting vectors, without influencing the initial values. You can only set NumComponents to be less than or equal to the number of components used to fit the LSA model. Exponent scaling feature component strengths for the DocumentScores and WordScores properties, and the transform function, specified as a nonnegative scalar. The LSA model scales the properties by their singular values (feature strengths), with an exponent of FeatureStrengthExponent/2. Component weights, specified as a numeric vector. The component weights of an LSA model are the singular values, squared. ComponentWeights is a 1-by-NumComponents vector where the jth entry corresponds to the weight of component j. The components are ordered by decreasing weights. You can use the weights to estimate the importance of components. Score vectors per input document, specified as a matrix. The document scores of an LSA model are the score vectors in lower dimensional space of each document used to fit the LSA model. DocumentScores is a D-by-NumComponents matrix where D is the number of documents used to fit the LSA model. The (i,j)th entry of DocumentScores corresponds to the score of component j in document i. Word scores per component, specified as a matrix. The word scores of an LSA model are the scores of each word in each component of the LSA model. WordScores is a V-by-NumComponents matrix where V is the number of words in Vocabulary. The (v,j)th entry of WordScores corresponds to the score of word v in component j. Unique words in the model, specified as a string vector. 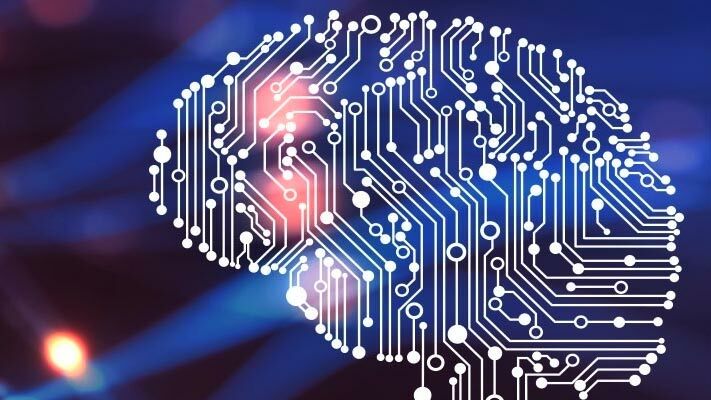 Fit a Latent Semantic Analysis model to a collection of documents. Fit an LSA model with 20 components. Transform new documents into lower dimensional space using the LSA model. Create a bag-of-words model from some text data. "I enjoy ham, eggs and bacon for breakfast." "I eat eggs and ham for dinner." Fit an LSA model with two components. Set the feature strength exponent to 0.5. Calculate the cosine distance between the documents score vectors using pdist. View the distances in a matrix D using squareform. 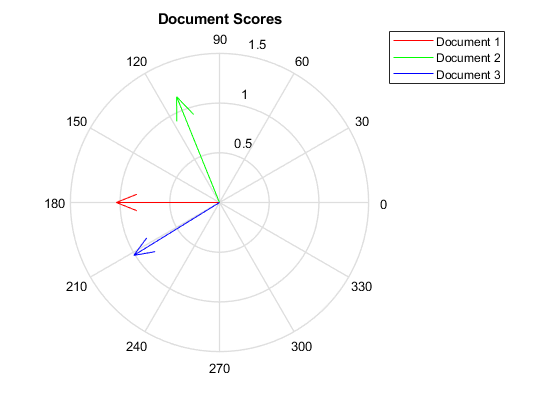 D(i,j) denotes the distance between document i and j.
Visualize the similarity between documents by plotting the document score vectors in a compass plot.